Today’s recipe is one that I’ve made in my kitchen at least 100 times. It’s nothing fancy. It’s not filled with trendy ingredients. It’s not particularly healthy (or unhealthy). It’s certainly not difficult to make. And it’s definitely not going to win any beauty awards with food styling. 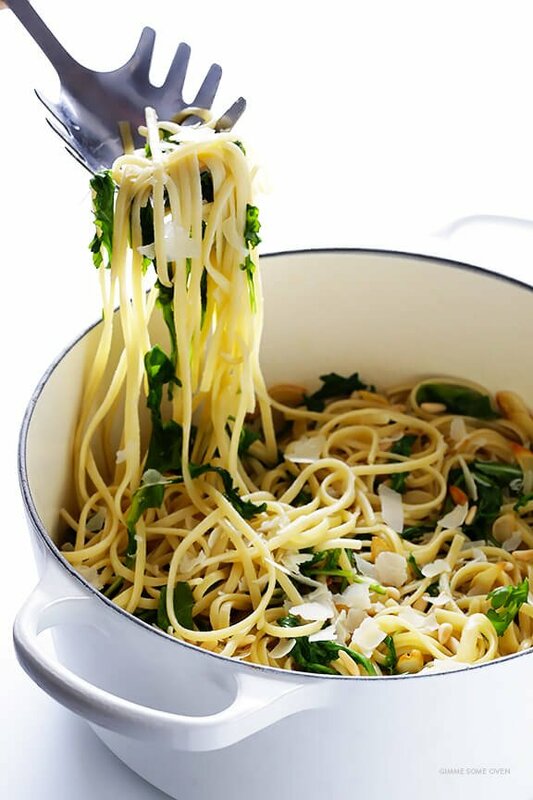 But oh my goodness, for some reason, I absolutely love this simple pasta. I actually shared this recipe on the blog a few years ago. But after making it again the other day for the zillionth time, I thought it might be worth bumping it back to the top of the blog to share with you once more. Maybe I’m the only one who loves it so much. 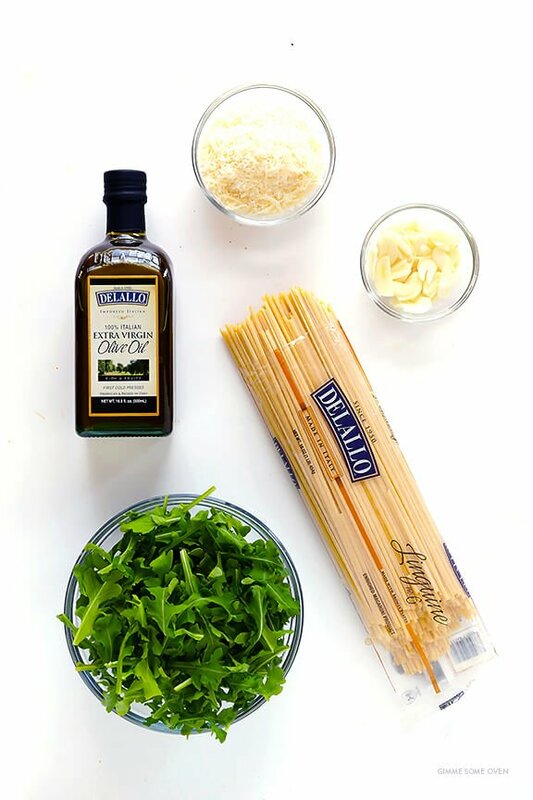 But whenever life gets busy and I find myself craving a bowl of carb-y comfort food, this easy pasta is my go-to indulgence. It’s ridiculously easy to make, it calls for 5 simple ingredients that I almost always have on hand, it’s remarkably flavorful with such few ingredients, it’s easy to customize with extra ingredients if you’d like, and — in my long history with this dish — it always hits the spot. I’ve tinkered around with the dish a bit over the years — trying out different cheeses (I was big into huge shaves of Parmesan 3 years ago when I first photographed this dish), subbing in different kinds of pastas (DeLallo’s whole wheat is always a fav), pouring a splash of white wine into the sauce, or adding in other proteins and veggies (sauteed shrimp and asparagus are always a good idea). 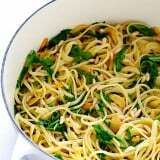 Then while your pasta is cooking, saute your garlic in the olive oil (or melted butter) until it is just lightly golden. 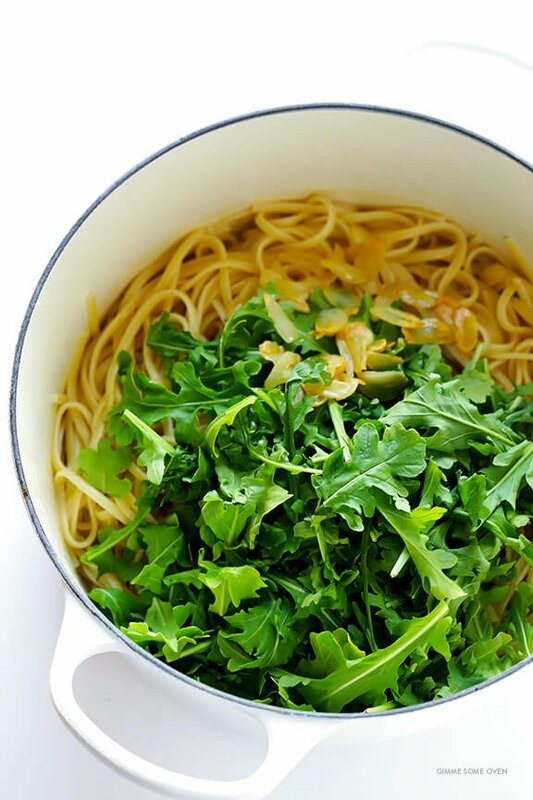 Add the garlic and oil to the pasta once it has been cooked and drained — along with tons of arugula and Parmesan — and toss it all until combined. And then voila — in less than 30 minutes, this deliciousness will be ready to go. Hope that you may find it as comforting and delightful as I do. 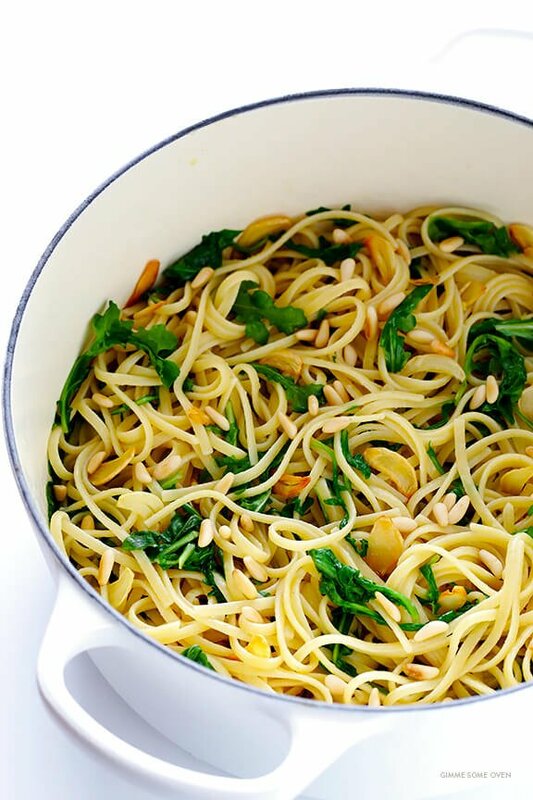 A quick and easy 5-ingredient pasta dish that’s packed with great flavor! Cook pasta al dente in a large stockpot of generously-salted water according to package instructions. Once the pasta is cooked, drain it. 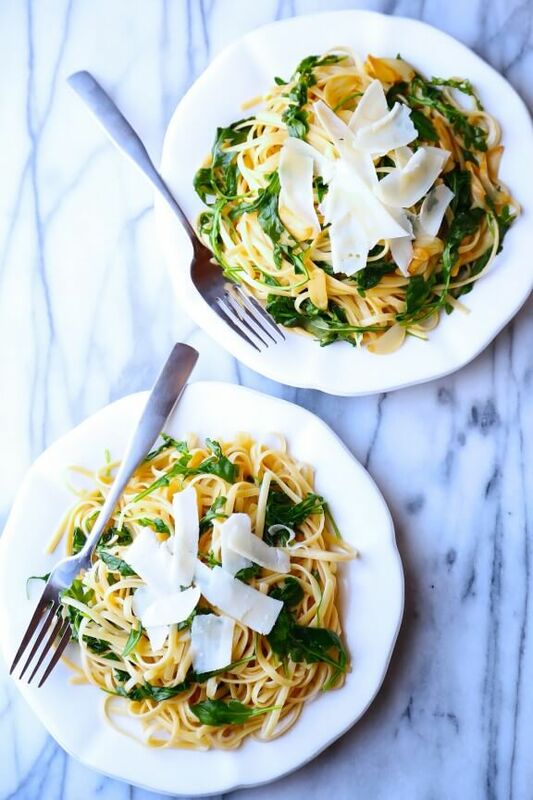 Then immediately stir in the garlic and olive oil mixture, arugula, and Parmesan cheese. Toss until combined. 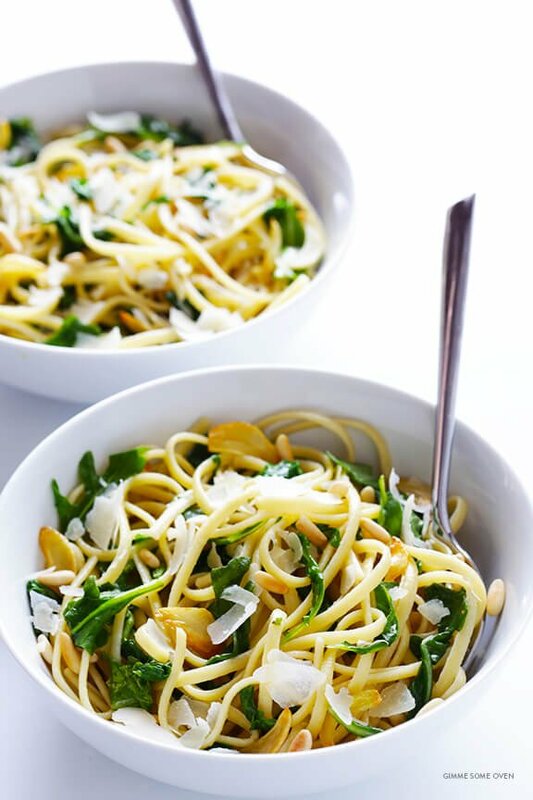 Serve immediately, topped with extra Parmesan cheese (and toasted pine nuts, if using).